Are you planning a beautiful winter wedding? If you are, chances are that you’ll be hoping for a brilliantly white wedding, with perfectly formed snowflakes creating a crisp white carpet over your wedding venue. Wouldn’t it be great to have a matching wedding invitation to get your guests in a seasonal mood? The Luxury Crystal Snowflake Wedding Invitation from Made with Love Designs certainly lives up to expectations. Gloriously elegant, featuring a dainty piece of lace which has been handmade in the UK, this invitation is the epitome of pure luxury. If that wasn’t enough, a beautiful snowflake adorned with sparkly diamantes takes centre stage on a length of satin ribbon (in your choice of colour) to finish the whole winter wonderland look off superbly. The words ‘Wedding Invitation’ along with the Bride and Groom’s name and the wedding date are printed in a classic font onto 300gsm pearlescent card, suitably shimmery for that all important snowy look. When your guests open their invitation (and when they’ve recovered from the sheer amazing-ness of it all), they’ll read your wedding day details that have been neatly printed on to a matching paper insert in your choice of white or ivory. 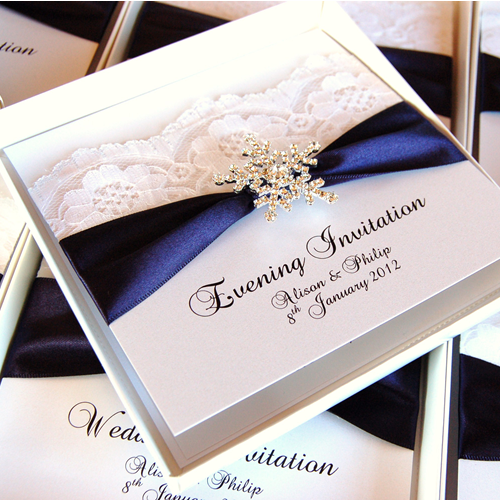 The invitations are provided with envelopes, but if you’d like to add another dimension to the whole affair, you can opt to have them sent out with made-to-measure boxes. If your wedding day arrives and Mother Nature forgets her gift of white snow, fear not, for your wedding day could be full of glamourous diamante snowflakes anyway! From Table Plans and Place Cards to Favour Boxes and Guest Books, the Luxury Crystal Snowflake wedding stationery collection will provide all the snowy sparkle you could ever desire for a perfect winter wonderland wedding! Tags: Crystals, Handmade Lace, Snowflake.